I care about the economy . "88% of Capitol Hill staffers agree that electronic messages from constituents influence their bosses' decisions." Choose the issues you care about & get alerts about relevant new bills. IssueVoter summarizes them, and offers pros, cons, and related news for context, keeping you informed year-round. 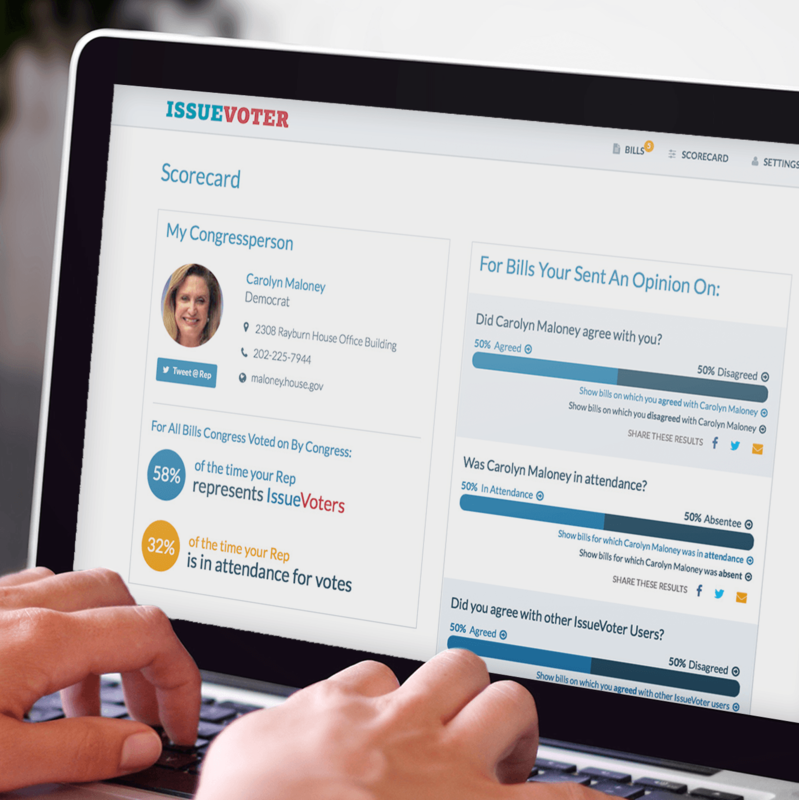 With 1-click, IssueVoter lets your Rep know how you want them to vote on bills, without you having to pick up the phone or mail a letter. These opinions truly shape how representatives vote and this tool has enormous potential to create change. Your private IssueVoter profile tracks how often your elected officials vote your way, keeping politicians accountable and helping you make an informed decision at election time. This was so easy and I finally felt engaged with our political system — with one click! I loved finding out how frequently I agree/disagree with my representative's votes – It is enlightening and empowering information for our next Congressional election! Contrary to the caricature, Members of Congress really do care what constituents think. We kept tallies of opinions about issues and constituent sentiment was a central part of the decision making process – it changes minds and changes votes. I love IssueVoter because they ignore the debate of Democrats vs. Republicans and focus on what really matters: issues that affect me, my friends, and my community. IssueVoter helps me understand the real laws on the table and most importantly, voice my opinion. Members of the media are invited to contact us at press@issuevoter.org. 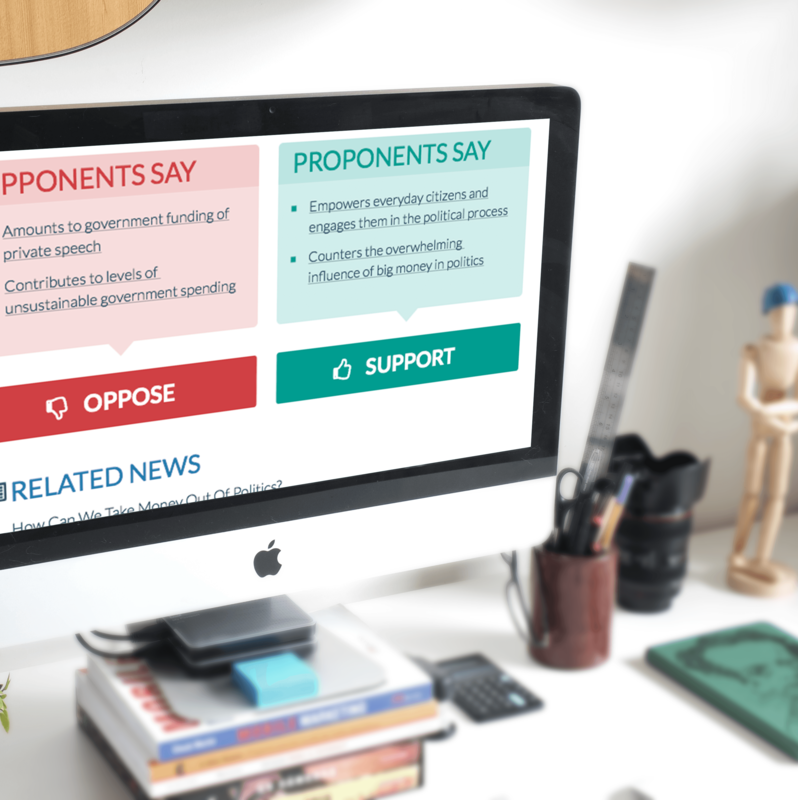 Be the first to learn how proposed laws are related to news headlines and get updates on IssueVoter.